One of the projects I’ve been working on in the evenings is picking over and sorting through the dried beans I grew last year. 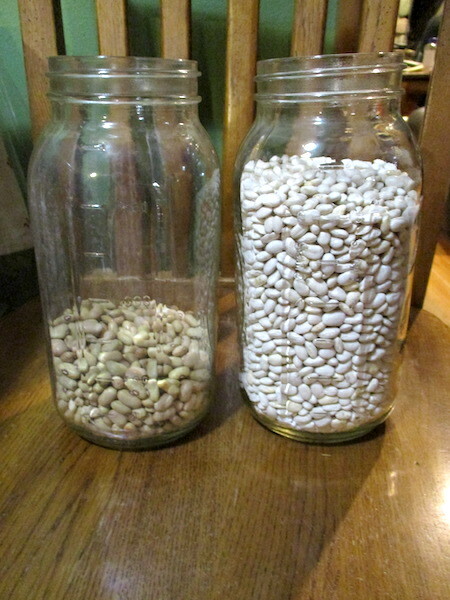 I seem to have ended up with three varieties: Great Northern, which we ordered seed for; a small red bean; and a slightly larger beige-colored bean. I’ve looked back at my Victory Seed orders for the past couple of years and don’t see anything other than the Great Northern beans, so I am not sure where the other two came from or what varieties they are. In our haste to get stuff put in, sometimes we lose track of what we plant in the garden and where. 65 to 90 days — A productive and early variety bred for cooler climates, 'Fast Lady Northern' is a heavy producer of delicious, smooth textured peas that are excellent for fresh eating and also do not require pre-soaking when using as a dry pea. The plants are bushy, semi-erect, and compact with yellow flowers. The pods are seven to eight inches long and are resistant to rain induced molding. At the shell stage, the peas are light green and turn white when dried. Easy to grow and harvest. Bred by Carol Deppe of Fertile Valley Seeds. There is much to chew on in here. Of course, the title of the book indicates that it’s right up our alley. I am enjoying what I’ve read so far. I also ordered packets of Painted Mountain and Montana Cudu corn along with the varieties of other stuff that we usually grow. I am scaling back a bit this year. 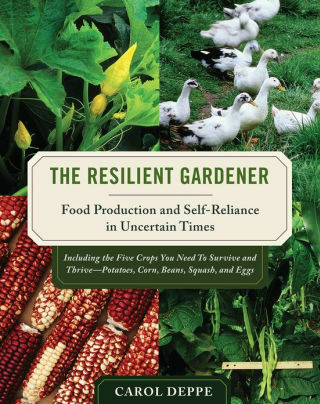 The garden has suffered from neglect the past couple of seasons and I need to address some of the stuff that’s already out there (berries, mostly) without having to worry about taking care of a lot of other crops. It will be months yet, but I can plan. I ended up not sewing yesterday after all. We’re supposed to get more snow today and tomorrow is a holiday, so I went to town yesterday morning and ran errands. When I got home, I canned 11 pints of chicken stock. I could have done a bit more, but I reserved some of the stock to use with the meat to make Instant Pot Keto Crack Chicken. This recipe has been making the rounds of the Instant Pot groups and everyone raves about it. I happened to have two pounds of cream cheese in my fridge (given to me by my friend, Anna, after a party she catered), so it seemed like a good time to try out this recipe. I did it on the stove instead of in the Instant Pot because the chicken was already cooked. I can see why people love it. It was easy and delicious. I served it over rice. Also, because it’s so rich, you don’t really need to eat a lot of it to feel full. (I am glad I doubled the recipe, however.) I may make it again today to use up the cream cheese and stock and the rest of the chicken. Part of not wanting to sew yesterday was driven by the post-project letdown that always comes after finishing something. It’s a phenomenon well known to knitters. I would expect the excitement of finishing a a project to provide enough momentum to propel me into a new project, but that doesn’t seem to be how it works. This will pass. It always does. I still need a good purse.